Labradorite is an iridescent gemstone with a fascinating schiller or metallic luster when viewed from certain angles. A member of the plagioclase feldspar group along with andesine and sunstone, labradorite is reasonably hard at 6 to 6.5 on the Mohs scale and has perfect cleavage in one direction. The base color of labradorite is a dark smoky gray, but when light strikes the stone in a particular direction, it displays striking rainbow-colored reflections. Most typically, these metallic tints are violet, blue and green; but sometimes yellow, orange and red can be seen. 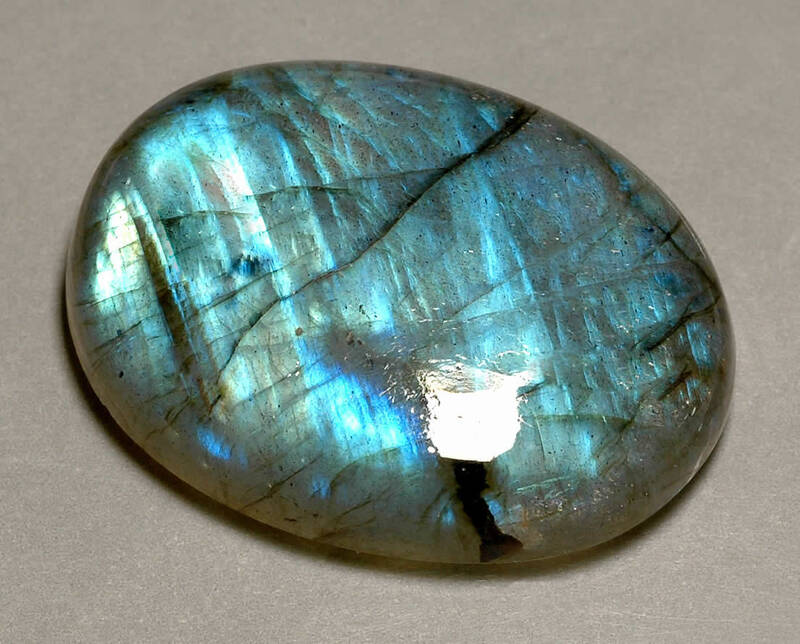 This effect is so unique to labradorite that it is referred to as labradorescence. The labradorescent effect is believed to be due to the presence of very fine platelets of different compositions as well as minute inclusions of limenite, rutile and possible magnetite, which cause the diffraction of light. Labradorite is usually cut en cabochon or in flat slabs in order to best display its iridescence. There are transparent yellowish-brown and colorless specimens that are cut with facets, but labradorite is best known as a colorful cabochon for pendants, bead necklaces, brooches, rings and ornamental objects. 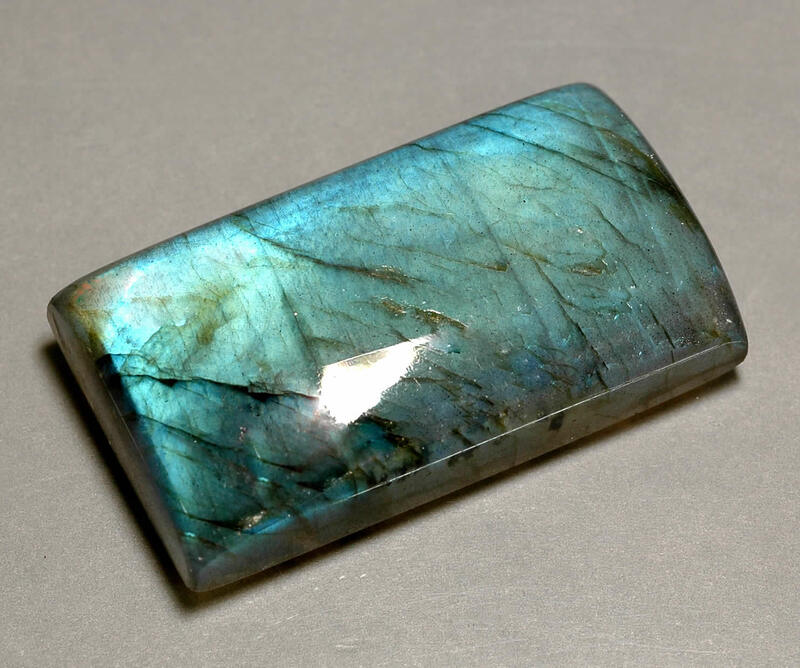 Labradorite was named after the Labrador Peninsula in Eastern Canada where it was first found around 1770. Deposits have also been found in Australia, Finland, Madagascar, India, Mexico and the Adirondack Mountains of the United States. Labradorite is thought to be a powerful stone that allows its wearer to see through illusions and brings insight. It is said to be excellent for strengthening intuition and for providing relief from anxiety, hopelessness and depression, replacing these negative feelings with enthusiasm, self-confidence and inspiration. According to a Canadian Eskimo legend, the Northern Lights were once trapped in the rocks along the coast of Labrador, and then a wandering Eskimo warrior found them and freed most of the lights with a mighty blow of his spear. Some of the lights were still caught within the stone, however, and thus we have the beautiful mineral known as labradorite.